Recently The Chopped Leaf launched the new Beet Bowl. Now I will let you in on a secret. I hate Beets. *gasp* Okay I should say I USED to hate beets. I tried. I really tried to like them, but I've never found a way I like them. They are super good for you. They are high in vitamin c (good for immunity) and fiber (good for nutrient absorbtion) and other essential minerals. From an Ayurvedic standpoint they are good for all constitution types and are known as a powerful blood builder and treater of ailments because of it's antioxidant and anti-inflammatory properties. So last week I went into try the new Beet Bowl for lunch. It came in this pretty bowl. And we all know we eat with our eyes first right? The colorful bowl certainly makes a pretty display. This bowl is packed full of nutrients and deliciousness. The blueberries create this nice sweetness, and the smooth feta adds a bit of saltiness getting that sweet and salty taste just right. The pecans add a wonderful crunch with the crisp lettuce, and the brown basmati rice adds a heartiness to the dish, leaving you feeling satisfied. Add the beets and top with the honey dijon dressing and perfecto! The sweet, salty and slightly sour from the honey dijon make a trifecta of tastes. In Ayurveda these three tastes are even known to be the three of comfort. I topped my bowl with smoked tofu since I'm a vegetarian, but they have other protein options or eat it on it own! At just 190 calories for the starter size this bowl is super satisfying and easily added to most's eating plans. Make sure you check out The Chopped Leaf giveaway and enter to win prizes they are giving away weekly! We live in a world of information at our every turn. Need an answer?, within seconds and a few taps we have an answer. This is amazing, but at the same time overwhelming. My goal with this blog, with everything I do in regards to health, fitness, yoga and nutrition is with the goal in mind to make it simple and approachable. I was having a conversation with someone about fitness and they said to me "I wish I was one of these people into working out and fitness". You know what I said? "I said that exact same thing 6 years ago." I tried many different things, running, weights, yoga, bikini competing, home DVD's, macro counting, gym group classes and so on. My love of fitness just sort of developed as I tried new things. We all start somewhere and I think so of us "fitness people" forget that a little. There is always new research coming out for better ways to work out and nutrition tips and so on. I think that is the most overwhelming part. We don't want to start working out, put time and effort in to find out we could do it an easier and better way? Burn fat faster or build muscle more efficiently right? But I believe that's part of the fitness journey. Trying things, finding out they don't work and trying something else. As I said in my Love Your Fitness blog post, try a bunch of things, find what you love and go with it. Who cares if it really burns fat the fastest if you hate doing it. What is there is a more efficient way at building muscle, but it draws everything out of you mentally to do it. Is it really that much more effective? Just MOVE YOUR BODY! Experiment with eating styles even. In a world of paleo, macro counting, clean eating, gluten free, vegan and so on, there is more then one way to get to whatever your goal is. Try something new. Health tips are another one. I remember years ago eating pomegranates was a huge craze, stores couldn't keep them in stock. It was the new superfood. Kale, almonds, arugula, turmeric, lemon water etc. Try some new stuff and what you like/what works for you is what you need. The only thing I will say, is give it some time. With each thing you try, give it some time without giving up so quickly. But if you like what you are doing and it feels good, it's likely not going to be that hard! If you like it you are more likely to stick with it, so tell nay sayers of your workout or eating choices to shove it! I love recipes that allow me to throw whatever is in the fridge into a meal, especially if it can be healthy. As we all do I believe. So loosely take what I have for ingredients and use whatever you'd like. 3 bell peppers (more or less depending on the amount of people you have. 1 cup of precooked rice. This is great to do if you have leftover rice from the day before or food prepping. I used leftover brown rice. 1 cup of kidney beans. Other options could be cooked ground beef or chicken or any other bean you have on hand. 1 cup of cheese of choice. We used marble, but mozzarella or goat cheese would be fabulous. salt and pepper and/or any other seasonings you love. Preheat he oven to 400 degrees. Heat oil in the pan and add the onions and beans until tender. Or you can add your meat of choice until cooked. Add the garlic and the greens until wilted. Add the rice to warm it up, if it's been cold in the fridge from leftovers. Cut the peppers in half and scoop out the seeds. Add cooked mixture to the inside of each half. Put the peppers on a cookie sheet and pop in the oven until the cheese is melted and the peppers are soft. I like to put on broil the last minute to get the cheese to bubble. What's in the fridge that you will put in yours? I've had this spaghetti squash on my counter for a bit. My daughters hate spaghetti squash and I love it. Usually I would cook it and save some to be eaten later but this squash was a little on the bigger side and I just know I wouldn't have eaten it all. So I cooked it up with what I had in the fridge for a vegetarian, gluten free side dish at a potluck I was heading to. I hate opening recipes and finding what seems like a million ingredients or finding I'm missing a couple and there is no way to make it. Really use what you've got. Use your veggies or maybe you'd prefer to have ground beef or tofu instead. Use your favourite cheese, they all get that gooey crust on top when you hit the broiler for a few minutes. Cheese of choice - I used Gouda, could use traditional mozarella or a lower fat version. Cook the squash. I'll give you two methods depending on your time. Cut the squash in half lengthwise. -Preheat the oven to 350 degrees. . Roast cut side down for abour 30-40 minutes. Or until your fork goes into the squash with relative ease. -You can also stick it in the microwave, cut side down for 5-10 minutes depending on your settings. While the squash cooks you can cook your vegetables or protein. For the vegetables I started with the carrots because they take longer to cook, then added the zucchini and bell pepper. Cook until soft and remove from the pan. Put the cooked veggies on a cutting board and cut up. This makes it easier to have the consistency of say ground beef without having to make sure all the veggies are the same size before cooking. A little more olive oil in the pan and cook the garlic and onion. Cook until soft and starting to brown. Add the pasta sauce to the pan with the garlic and onions and turn the temperature down low. Add seasoning to taste. Add the vegetables back into the pan with the sauce. Remove pan from heat. Preheat oven to 350 degrees if you didn't use the oven to cook the squash. Now assemble like a lasagna! Little bit of sauce at the bottom, layer of spaghetti squash, layer of sauce, layer of cheese and repeat. Mine had two layers, but I had a longer shallow dish. Do with what you've got. Bake for 45 minutes. Then hit broil for 3-5 minutes just until you have some browning on top. Watch this carefully, broil can go from perfect to burnt quickly. Macro counting, flexible dieting, If It Fits Your Macros. Many names for it. I have been doing flexible dieting for about a year and I used it for my bikini contest prep even. Here is a good blog post guide on how to macro count. I thought I would direct to a good article instead of trying to rewrite something written a million times. I also suggest checking out Layne Norton for info and blog posts. Likely the most famous flexible dieter. This post isn't about how to macro count, but why I love it and think its appropriate for majority of people. Mama Lion strong wrote a blog post about how it can be hurt a few with eating disorders and I agree, but for the most of us it's a great tool to have. So flexible dieting is all about obtaining a certain amount of calories, with ratios of fat, carb and protein designed for the type of activity you are doing. Calorie deficit = weight loss, calorie maintenance = body recomp/fat loss without weight loss, calorie surplus = weight gain. When you are tracking these three main macronutrients you are eating "what fits" into them. So say you love oreos (okay so I do) and it's something you would like to eat. You plan to fit two oreos into your plan at the end of every day. (okay so this is what I do). As long as I'm eating within my fat, carb and protein limits (and obtaining a minimum daily fiber intake) I can eat them. Now obviously if I ate just oreos and protein shakes all day, every day I could keep within my numbers, but I wouldn't hit my fiber intake (which is pretty important) and I would be pretty hungry. Usually these junk type food are high glycemic indexed, so meaning they enter the blood stream quickly and leave quickly. Whole food, generally are slower processed the body so you don't feel as hungry. Most of us flexible dieters say we usually eat 80% whole foods, 20% what we want. Of course the main reason I love this is because I get to eat the things I love and crave. Without the guilt. This is a big one. My entire life I've grown up in a society that says cookies and cake are bad. Feel ashamed for eating those awful things and get started on your diet tomorrow for doing it. How many times have you been at a party or something and your friend turns to you and says "I can't believe I ate this and that, I'll punish myself in the gym tomorrow for it" Or "I guess it's only salads all next week to make up for all this crap I ate"? Or you buy a bag of said Oreos, eat an entire row or bag and feel terrible after. Aside from the sugar rush tummy ache. But what if you planned to eat two Oreos each night? Or planned on having that McDonald's burger on Tuesdays because Tuesdays at work are always busy? Planned it to fit into your macros. And ate whole foods the rest of the day and stayed within your macros? Where would the guilt and shame be? Lost, that's where. The thing I've struggled with in the past is the spiral. I ate this and feel crappy about it, so the rest of the day is lost. Continue eating like this today and start again tomorrow. Tomorrow comes and I eat a donut at break and think the day is lost and yesterday repeats itself. There is guilt that goes with "failing" at my diet that day. But now I eat something unplanned, like when my oh so adorable daughters bat their eyelashes for a donut at the shop next to the gym. I get one, eat it, enjoy it and adjust my foods the rest of the day to make sure I stay within my numbers. Look at that, true "guilt free" foods. Now the other part I love about this type of eating style is it fits whatever you eat! Paleo? Still can count macros. Gluten free? Vegetarian? Organic whole foods only? You can still count macros. I am a vegetarian and eating mostly whole foods and organic. I use foods in a holistic manner, by eating certain foods that help ailments and so on. For example I had some gallbladder issues this winter and I was eating foods that specifically helped me with it and avoided the ones that hurt me more. All while staying within my macronutrient range. I'm not going to say I don't go off track, or occasionally "yolo binge" etc. But that's part of being human and the past 29 years of being made to think that's basically the way we should eat. Old habits die hard. That's also part of the perseverance training, to get back on that damn horse after unplanned "carb loading". Ha ha. Macro counting may not be for everyone, It does require some work. The first few weeks are a pain trying to set up foods, navigate how things fit and weighing/measuring everything. But eventually it gets easier and you learn how to count with eyeballing even. I can look at a food and give you a pretty good idea of what the macro profile is now. If you are interested in macro counting, I strongly recommend the above blogs, plus doing some research online. Some of the calculators online are pretty aggressive and I don't agree with. But one I think comes pretty close is macronutrientcalculator.com . Calorie counting app, My Fitness Pal, Calorie King, Bodyspace are all popular. Thanks for reading, and no matter your "eating style" as long as it makes you happy and gets you the results you want, tell others to piss off and enjoy. It’s funny how I can’t recall one person asking me why I wanted to run a half marathon when I was training for it. Or I have never thought to ask friends why they want to compete in Crossfit competitions or Super Spartan races. But I’ve had a lot of people ask me why I want to compete in this bikini competition. Is it because it’s basically being judged on your look? Maybe a contemplation for another day, before I get to far into it? I originally planned to write this post after the competition, but today seemed like a good day. I first decided I wanted to compete in September last year. Original thought process was “that would be cool to do one day”. And it went on the bucket list. But ya see; the thing with me is sometimes I become fixated on things and I have a hard time letting go of them. This became one of those things that stuck. So why compete? Why not? Why be ordinary? Why not do the things that we think are impossible? Why not dare to be extraordinary? We don’t all have to be extraordinary by selling our worldly goods and moving to India or jumping out of airplanes. If you do those things and they make you happy, then amazing. But for me, smaller odder goals are my thing. That new song about being the life of the party and take your shot, it might be scary…. Exactly. Maybe it’s the scary that attracts me to doing things like this. I did it to push myself. Doing the uncomfortable makes us grow, makes us learn about ourselves. I never want to look back on life and say I wish I tried this, or I’m too old for this now or whatever lies we tell ourselves to make us feel better about not doing the things we never did. Bring myself to that “edge” as my yoga teacher calls it. Nothing wrong with pushing yourself to the limit. As long as you don’t stay there I suppose. To self observe, to learn about myself. I remember telling a friend I wanted to compete when I first started thinking about it and was told to make sure I don’t take it out on my kids. I was a little offended at the time, but the more and more I’ve read about people not handling the process, well I understood it more. Lowered calories/carbs, excessive training, meticulous food intake, no alcohol, dehydrating practices or heck even the excessive peeing from crazy water intake would have an effect on anyone. The things I’ve learned about myself are incredible to see. Again, probably another blog post. To prove something. To break the mold of the “typical” bikini competitor. We see them typically as young, childless cardio bunnies, who eat only chicken and broccoli. Well I saw them that way I guess. I wanted to do it another way. As a vegetarian. I have been a veggie for 19 years and get asked ALL THE TIME, “how do you get protein?” Let me tell you something, all veggies are sick of this question. Especially athletic ones. As a mom. I have two children, 1.5 and 3.5 years old. Being a role model is important to me for my girls. Not role modeling ab out having a lean body. Being a role moel for ssetting goals and sticking to them. Persevering through tough times and being humble when they are good. As natural as possible. Non GMO soy products, no funky heart racing preworkouts, no fat burning pills, and aside from the occasional Quest bars that had sucralose in them, no artificial sweeteners. As a “if it fits your macros” counter. Again another blog post, but google macro counting, it’s pretty cool. I basically ate oreos my whole prep until the last few weeks. Not a lot of them, but better then the none most get. Ha ha. This kind of has a second point to it. I wanted to make sure I maintained a healthy relationship with food. Not look at a carb and cry how it will make me fat, or have an accidental slip on my diet and starting thinking of ways to negate it. I’ve read over and over again how competitors have many eating disorders. Prove to me? Prove to you? Not sure exactly. Just to see if I could do it differently. Following the road to competing but on my own path, on my own journey. And finally for the athleticism of it. I enjoy working out. I love weight lifting. Maybe not cardio so much to be honest ha ha ha, but I have become one of those people that loves fitness. It’s exciting, and I will try any type of it once at least. Even if it includes doing deadlifts 3 days a week……… Don’t lie to me, aint nobody like deadlifts. So on the eve of the eve of my competition I’ve had a nice reflection of why I have done all this. Tomorrow I get my tan and go for my weigh in for Saturday. It’s been one incredible journey. No matter what happens Saturday, first place, last place or flat on my face, I’ve done it my way, learned a lot along the way and am ending with self respect, self love and a whole lot of pride. I found this amazing recipe on Pinterest and now I can't find it again! I feel awful not pinning back to the original source but I promise I searched and searched for it! You know how Pinterest is, see it once and don't pin and never see it again. If I come across it I will edit this post. Anyways, I found this recipe and I loved it so much I wanted to share it and how I used it. It's for crepes. Sweet or savory. They turned out nice and hardy, touch enough to handle like a tortilla for my lunch even! 1/2 scoop vanilla protein powder. I used allmax natural vanilla. 1/4 cup (21g) flour. I used barley flour but refer to my Different Flour, Differnt Folks post about the one best for you. Couple drops of vanilla stevia, because I wanted them sweet that day. Macros: Calories 167, Fat 1g, Carbohydrates 17g, Protein 23g, Fiber 3g. 1/2 scoop plain protein powder. I used allmax natural unflavoured. 1/4 cup flour (21g). Again I used barley. Macros: Calories 171, Fat 1g, Carbohydrates 17g, Protein 24g, Fiber 2g. Heat a pan on medium low, use a non stick pan. Mix ingredients together. Batter will be runny and that's what you want. Pour a batter into the middle and swirl the pan around to spread it out quickly. Spread less for a thicker crepe, good for holding heavier ingredients like you would a lunch wrap. Flip when the edges start to crust a bit. Fill/top and enjoy. There is a few options for what to do withe them below. Make some smaller crepes,so you have a few more of them, layer stevia sweetened greek yogurt in between the layers and top with chocolate almond butter (or nutella). Macros with 87g greek yogurt and 8g chocolate almond butter: Calories 345, Fat 8g, Carbohydrates 32g, Protein 36g. 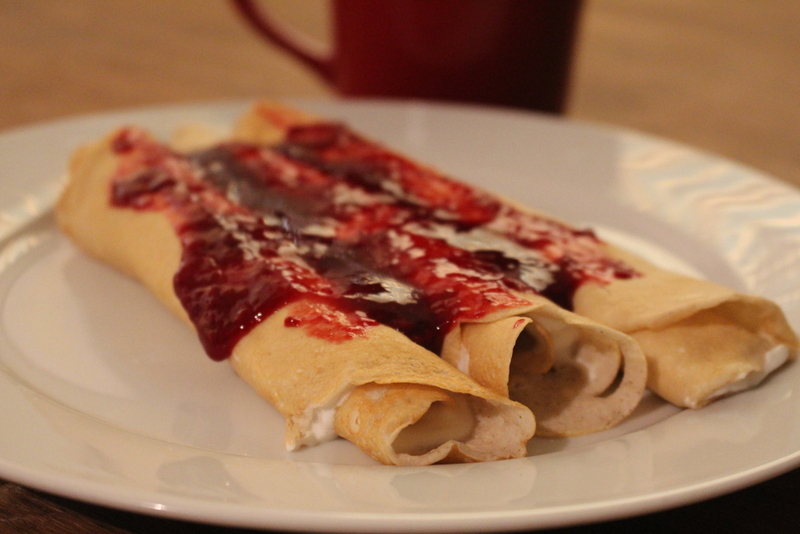 Make into few bigger crepes, fill with stevia sweetened greek yogurt, top with warmed double fruit low sugar strawberry jam. Macros with 1/2 cup greek yogurt 116g and 2 tbsp double fruit low sugar jam: Calories 274, F 1g, Carbohydrates 31g, Protein 35g. 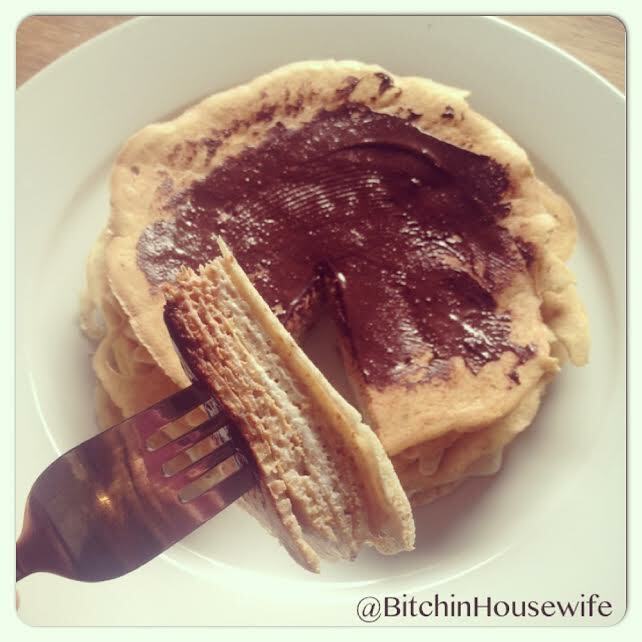 Make into two thicker pancake like crepes and fill with veggies and protein of choice. I used Gardein seven grain vegan chicken tenders, avocado, tomato and romaine lettuce. 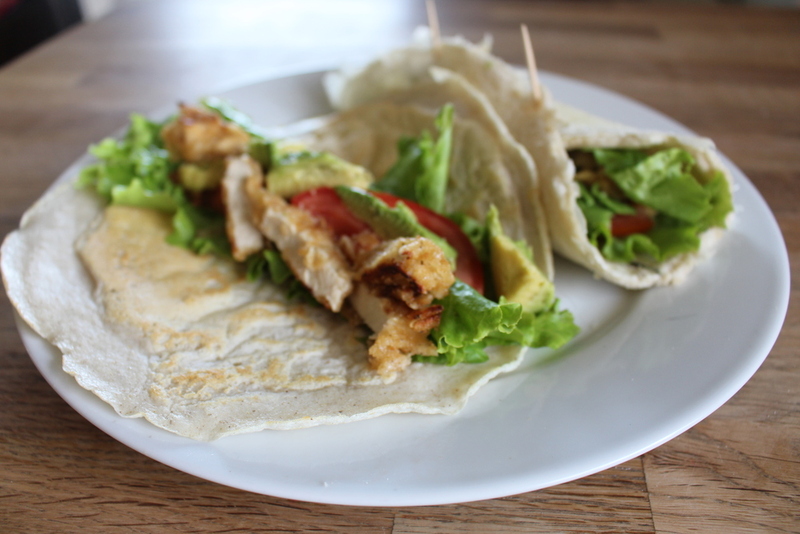 Macros with vegan chicken tenders, avocado, tomato and lettuce. Calories 338, F 11g, Carbohydrates 30g, Protein 33g. Yeah that's right, I said mugBread. Like banana bread? Because it taste like that. Uh huh, I created single serving banana bread, so you don't have to bake a whole damn loaf, wait an hour for it to bake, hour to cool and then resist eating more then a slice. Not to brag, but this is pretty amazing and the texture is spot on. Who am I kidding, I'm totally bragging. But this is my blog and I can do what I want. :* I love banana bread, LOVE banana bread. And based off my last post of my Protein Strawberry Shortcake Mugcake, you can gather, I'm pretty in love with mugcakes right now. 3 tbsp Barley Flour (21g). Coconut flour, whole wheat flour etc would all work too, macro numbers would change slightly. 1/4 cup egg whites or two egg whites. Vanilla Stevia, could also use regular stevia to your taste with vanilla extract. 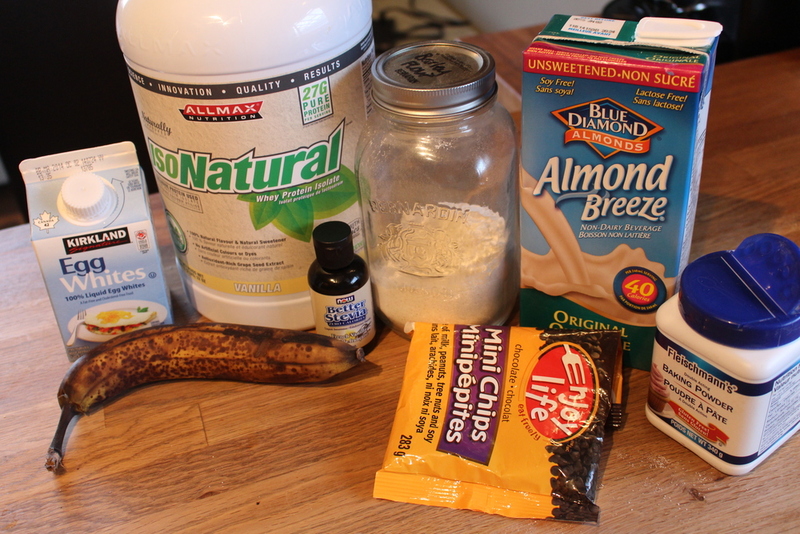 In a bowl mix vanilla protein powder, flour, baking powder, egg white, almond milk and stevia. Add most of the mashed banana. I added 50g. Save a bit to top with. Add half the chocolate chips. Spray your mug with non stick spray. I forget to mention my mug is a soup mug. Try and use a bigger mug! Pour mix into mug. Chips will settle at the bottom and that's okay. Take cooked bread out, turn upside down onto a plate, top with remaining chips and banana. Enjoy the hell out of this! 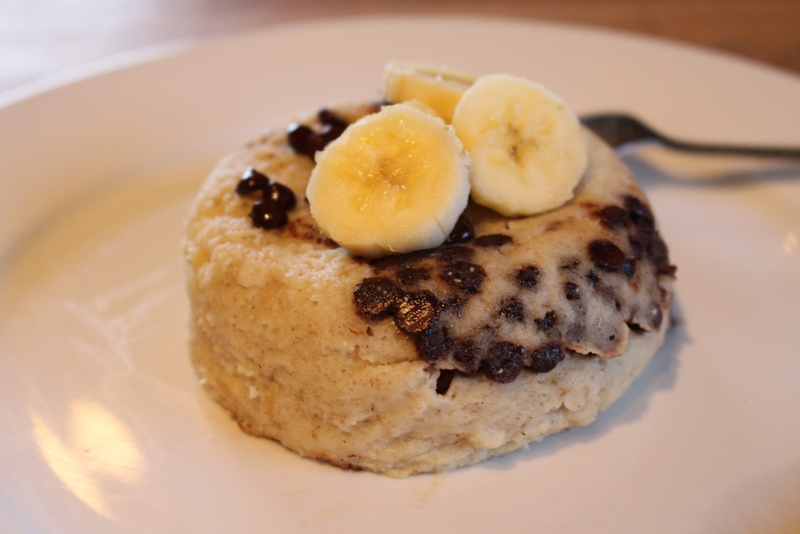 Macros: *Note the carb may be higher then most mug cakes, this is due to the banana, hence why I'm calling it bread. But trust me they are so worth it baby. Soften the onions in the garlic and coconut oil inside the pot. Add the tomatoes, tomato paste, bay leaf and salt and pepper. Let simmer. Her recipes says 2 hours, I did 1.5 hours, with adding more stock at like 45 minutes. (hence the odd ingredient amount) It was seeming very thick already so I added more and pulled it off earlier then her recipe. Add the seasonings to your taste. I was tempted to add chili powder but figured I would try a traditional version first. 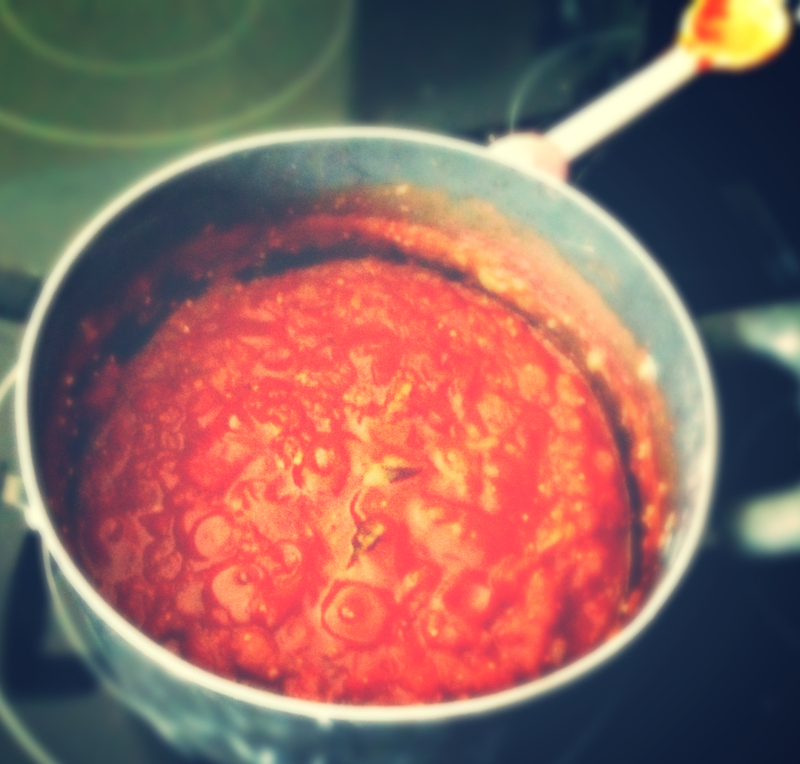 I ate a bowl of whole grain spaghetti with some sauteed red kidney beans and spinach with this sauce for lunch. So delicious. And toddler approved. AND vegan/vegetarian. Once relatively cooled I put the leftovers in freezer bags for future use. Next time I will make 2 or 3 times as much for larger batches that will last a long time.